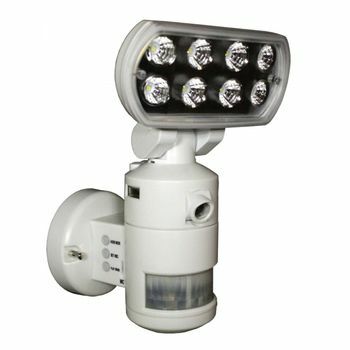 The New and improved Versonel Nightwatcher Robotic Security Motion Lightning Camera is a LED Security Light with Color Camera has a patented motion tracking feature built into a PIR lamp (Passive Infrared Sensor) with LED floodlight. Available in Black or White color, it also includes an integrated digital color camera with built-in SD memory card which will record or photograph events. 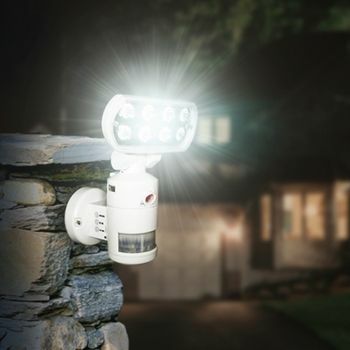 The intelligent motion/heat activated sensor tracking light on the Versonel Nightwatcher Pro VSLNWP702 detects an intruder's motion within the field of vision of the PIR and points the lamp directly at the intruder. As the intruder moves across the PIR field of vision, the motorized NightWatcher lamp head takes aim and follows. Each time motion is detected, the light will turn on for 3 minutes pointed in the direction of the motion and the on-board color camera begins recording to a built-in SD card, capturing each moment. The distance of the sensor range will vary from a minimum of 10 meters / 32.8 ft. to a maximum of 17 meters / 55 ft. , depending on weather conditions. 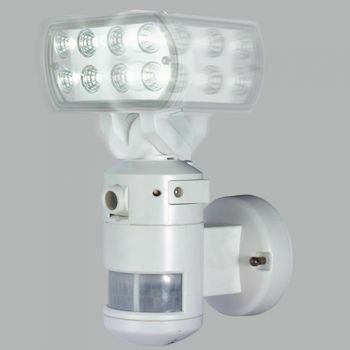 Programmable functions for continuous all day or night only activation and the motorized LED floodlight saves you energy and extends the lamp life up to 30,000 hours.